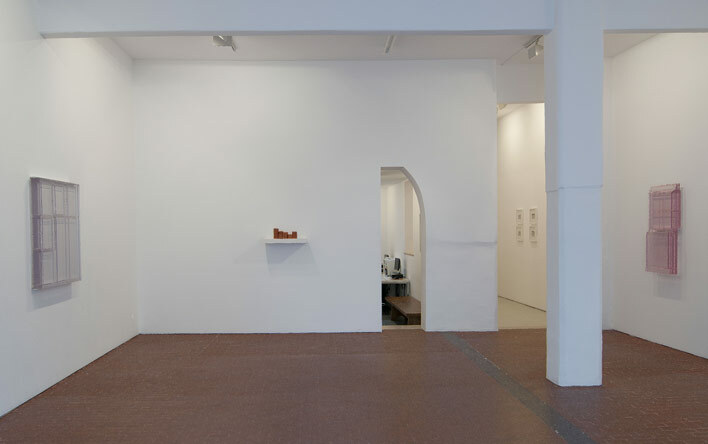 Galleria Lorcan O'Neill Roma is pleased to present a show of new sculptures and drawings by Rachel Whiteread. Whiteread is one of the most prominent international artists of her generation. She creates sculptures which investigate architecture, space, absence and memory. Her works very often explore intimate domestic spaces and household objects bringing to evidence invisible aspects of their ordinary life. She typically uses industrial materials such as plaster, resin and rubber to cast the negative space surrounding or within an object: the void under a chair, the space inside a cardboard box, or that around a collection of books, floors, but also the space of rooms and entire buildings. The resulting sculptures preserve the texture and form of the original objects, yet they appear as revelations, uncanny ghosts of the original objects they are drawn from. With the new body of work at Galleria Lorcan O'Neill Roma, Whiteread re-examines the subject of doors and windows, using resin as her medium. She continues her constant investigation of the domestic space and its connotations, with its capacity of containing memory and history in a very subtle way. Six of the pieces are windows: some are clear, some coloured, one opaque. These windows are created by first making the casts of the front and the back of each existing window frame and then combining the two to create an inverse of the original. These windows are not things to be looked through but to be looked at; they force us to recover the sensation of looking anew. The objects themselves are beautiful, changing colour in the shifting natural light - a faint grey for Dusk and Spy, a pale lilac for Violet, a soft pink for Blush, a clear transparent green for Look on, a deep opaque blue for Night Glass (the only work made in fiberglass). The choice of colour evokes in some cases a specific time of day (Night Glass and Dusk) thus the works refer to both space and time, in an attempt to make a synthesis of a transient presence. The show includes a pink translucent door, Threshold, which captures light as in a poetic suffused interior, and leans almost casually against the wall. It is a threshold that can't be crossed except by the imagination. The door, when you look closely, isn't a cast of a door, or even a cast of the two sides of a door joined. A Whiteread door or window scatters the opposition of outside and inside. The resin works are complemented by a concrete under-chair element, Untitled (II), a new shelf piece, Five, which contains sculptures of five beverage cans cast in plaster with iron oxide to appear rusted; and a group of new works on paper: postcards of landscapes and scenery that the artists has whitewashed and punched with circles of different diameter, leaving only the skies with all its different nuances visible and untouched. These works become three-dimensional objects which have a very poetic and pure presence. Whiteread (born in London, 1963) is one of the few artists of her generation to have produced important public sculptures. She has represented Britain at the Venice Biennale in 1997; and had exhibitions at the Guggenheim Museum, New York, the Tate Modern, London, Kunsthaus Bregenz, and the Serpentine Gallery. Her recent drawing retrospective travelled from the Hammer Museum, LA, to the Nasher Sculpture Center, Dallas and Tate Britain, London (2010). In 1996 she received the controversial commission for Holocaust Memorial at the Judenplatz in Vienna, which she completed in 2000. Notable public commissions include House (1993), Water Tower (New York, 1998), Monument (London, 2001), and Embankment at Tate Modern, 2005. In 1993 she was awarded the Turner Prize.